Objective: Certain anthraquinone compounds are effectively used for treatment of cancer. The present study describes the inhibitory activity of lac dye, a mixture of polyhydroxy anthraquinone compounds (Laccaic acid A, B, C, D and E), produced by the Indian lac insect, Kerria lacca (Kerr). Materials and Methods: In vitro testing for anticancer activity of lac dye was done at four concentrations (10, 20, 40, 80 μg/ml) on ten human malignant cell lines including six human leukemia cell lines, U973, Raji, K562, Jurkat, MOLT 4 and HL60 using SRB assay. Results and Conclusion: Both crimson and yellow lac dye inhibits proliferation of Human leukemia cell lines, Raji, U937, K562, HL60 and Jurkat, therefore can be considered as a potential anticancer agent for leukemia. Cancer is one of the most dreaded of the human diseases, causing about 13% of all deaths. Leukemia, which is characterized by abnormal proliferation in white blood cells, accounts for 2.8% of all cancers. Anthraquinone compounds, such as doxorubicin, epirubicin, and daunorubicin, are widely used for treatment of cancers; daunorubicin is one of the most effective drugs for treatment of leukemia. Fungal toxins having polyhydroxyanthraquinone structure were shown to have prominent antineoplastic activities against Ehrlich ascites carcinoma cells. In vitro anticancer activity testing on human malignant cell lines was done using SRB assay protocol  at Advanced Centre for Treatment, Research and Education in Cancer (ACTREC), Tata Memorial Centre, Mumbai. Crude lac dye was obtained from pilot plant facility for lac dye extraction at Indian Institute of Natural Resins and Gums, Ranchi. Initially, crude crimson dye was dissolved in water and precipitated as sodium salt in the presence of dilute acid and then dried in dessicator. Partially pure crimson dye and crude yellow dye were dissolved in water and filtered repeatedly using filter paper of 0.19 mm thickness (Sartorius stedium biotech, 292a) and dried at 40ºC for 24-48 hrs. Lac dye was obtained and checked for complete solubility in deionized water. During the six month period (June-Nov, 2013) of this experiment, both yellow and crimson dyes, IINRG-KLC1 and IINRG-KLY2 respectively, were tested at four concentrations (10, 20, 40, 80 μg/ml) against six human leukemia cell lines, U973, Raji, K562, Jurkat, MOLT-4 and HL60; an ovarian cell line, SK-OV-3; one cell line derived from human lungs, A549; one melanoma cell line, SK-MEL-2 and one neuroblastoma cell line, IMR 32 originated from human peripheral nervous system. Appropriate positive controls were run in each experiment with three replicates. It was observed that both crimson and yellow lac dye inhibited cell growth of Leukemia cell lines (Raji, U937, K562, HL60 and Jurkat) [Figure 1]. 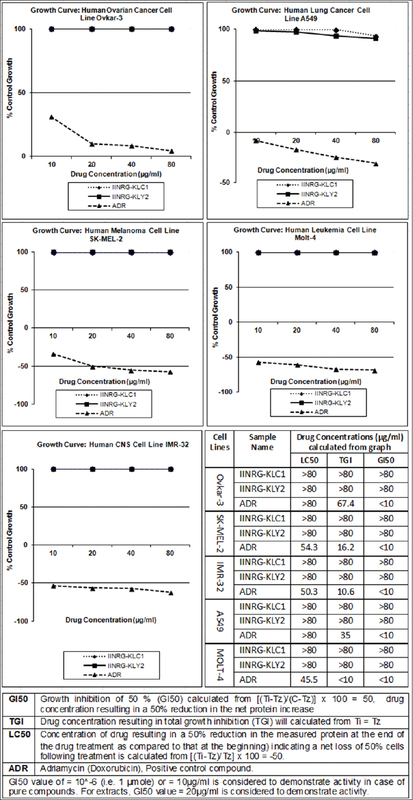 At 80 μg/ml concentration of crimson dye (IINRG-KLC1), the percentage growth observed were 15.4 for Raji, 40.1 for U937, 72.5 for K562, 69.8 for HL60 and 83.7 for Jurkat. 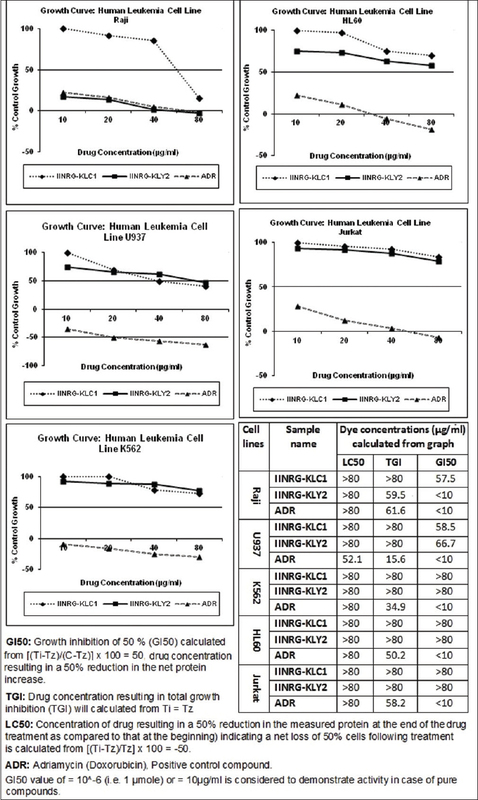 Similarly, the yellow dye (IINRG-KLY2) at the same concentration showed the percentage control growth of - 3.3 for Raji, 46.4 for U937, 77.4 for K562, 58.1 for HL60 and 79.1 for Jurkat cell lines. An increased inhibitory activity was observed with increase in concentration, in general [Figure 1]. Both dyes were found inactive on other five lines tested [Figure 2]. Intercalative binding of laccaic acid with DNA was shown by Goswami et al., based on spectrophotometric studies. The current finding of inhibitory effect of lac dye on the viability of Leukemia cell lines could be due to binding of laccaic acids with DNA. This finding offers an excellent opportunity for the development of lac dye as novel therapeutic agent against leukemia. The yellow lac dye that is laccaic acid D was especially found active on human leukemia cell line Raji. We would like to express our deep sense of gratitude towards Dr. K. Mukhopadhay, B.I.T. Mesra; for his valuable advice, encouragement and support. We would like to acknowledge the financial support by the ICAR NAIP Component 4. Choudhury SM, Gupta M, Majumder UK. Antineoplastic activities of MT81 and its structural analogue in Ehrlich ascites carcinoma-bearing Swiss albino mice. Oxid Med Cell Longev 2010;3:61-70. Shamim G, Ranjan SK, Pandey DM, Ramani R. Biochemistry and biosynthesis of insect pigments. Eur J Entomol2014;111:149-64. Hu D, Hasegawa A, Nakatsuka S. Isolation and structure determination of laccaic acid F from lac-dye produced from Thai sticklac. Heterocycl Commun 2011;4:327-30. Rafaëlly L, Héron S, Nowik W, Tchapla A. Optimisation of ESI-MS detection for the HPLC of anthraquinone dyes. Dyes Pigments 2008;77:191-203. Bechtold T. Natural Colorants – Quinoid, Naphthoquinoid and Anthraquinoid Dyes. In: Bechtold T, Mussak R, Editors. Handbook of Natural Colorants. Chichester, U.K.: John Wiley and Sons 2009; p. 151-82. Caro Y, Anamale L, Fouillaud M, Laurent P, Petit T, Dufosse L. Natural hydroxyanthraquinoid pigments as potent food grade colorants: An overview. Nat Prod Bioprospect 2012;2:174-93. Goswami DN, Prasad KM, Prasad N. Spectrophotometric studies on the interaction between laccaic acid and DNA. Curr Sci 1988;57:30-2.